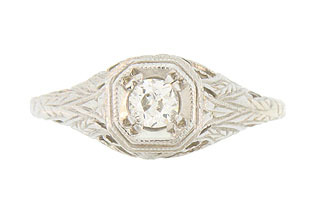 A dazzling .16 carat round cut diamond is set into the face of this antique style engagement ring. 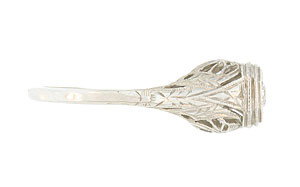 A ribbed domed mounting rises above the organic filigree setting. 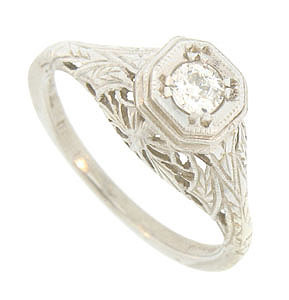 Elaborately engraved leaves drape down the shoulders and sides of this spectacular ring. 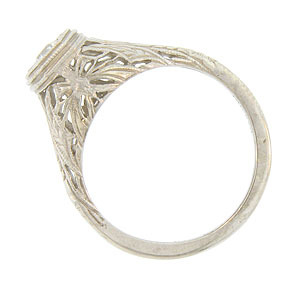 The wedding ring is fashioned of 14K white gold and measures 7.32 mm in width. Size 4 3/4. We can re-size.